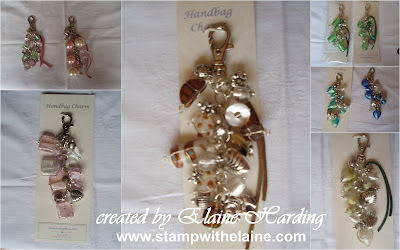 Elaine's Creative Musings: ....& now for something different - Altered Tins, lunch bags and charms! ....& now for something different - Altered Tins, lunch bags and charms! I thought my readers might like a change from reading all about cards so I thought I would share these. 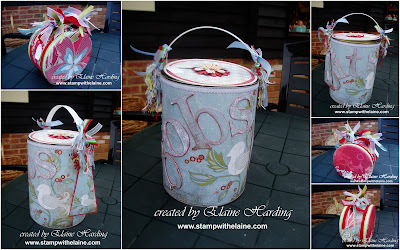 These altered tins are a blast from the past - I recently gave one away as a present - the large paint can for "bits & bobs" which I am rather fond of. It has been much admired by a dear friend who asked if I could make one for her eversince she espied it. However as I couldn't remember where I sourced the blank tins from, I decided to give this one to her instead of keeping it for myelf. I'm so glad I managed to take a photo of it before giving it away! At least I have the little semi-circular girlie one to serve as a reminder of my time at the craft village. I used to rent shelf space at a craft village close to home and one of my signature products were mini albums. 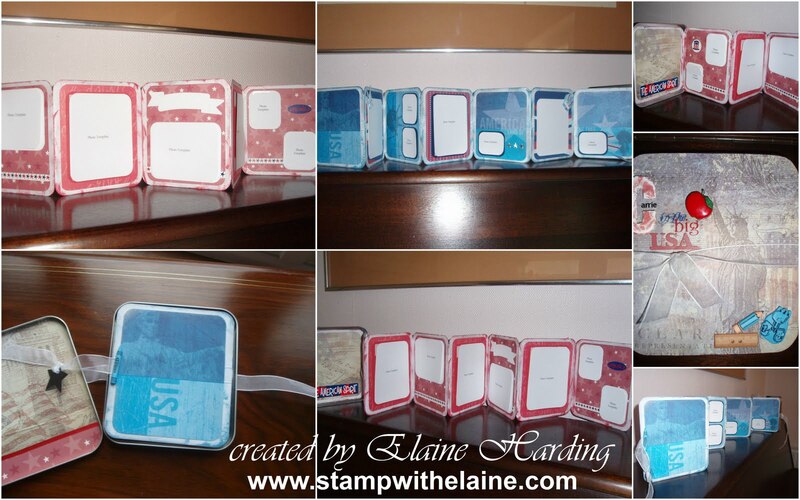 Again these are altered lunch bags made into a mini album with pockets for memorabilia and a hard cover. 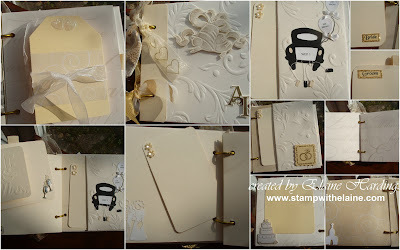 The one above is a wedding album. I also did commissioned work, this is just one of the albums with an American Theme because it was being made for a lady about to embark on a stint in the big apple to study, hence the ruler, satchel and pencil embellishments and all tucked away into the tin. It all started off as Baby albums, typically blue for boys and pink for the girls and for pets and every occasion under the sun - "Mum's Brag Book", "Noel" or "Memories" were just some of the titles I made. Naturally I had to introduce a wider range of product over time, so I tried my hand at making handbag charms which became the rage at one time. I used glass and silver beads plus leather thongs to embellish with. The pictures are a little out of focus as in those days, I didn't have a photo studio or light box and I had to lay it on a linen white napkin! Okay, so enough of my trip down memory lane - back to SU, that's a promise! 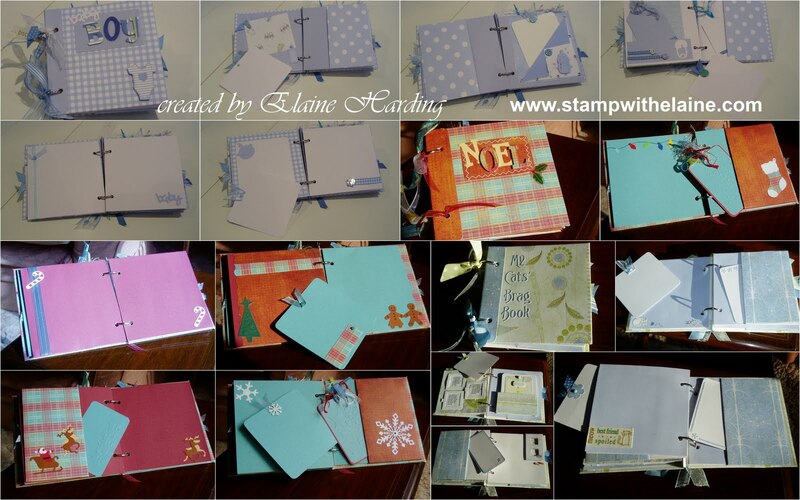 Great to see what you did before stampin up, some wonderful creations, love the albums.